Be it in your backyard, or off on a global adventure, glamping provides an experience no hotel can match. Sleeping under the stars, away from stress, noise, and wifi might be just what you need. Read on to find inspiration and real adventures you can book for yourself. This destination aims to combine embracing the outdoors with a little bit of luxury—a spacious tent, hot showers, and fresh bed linens to name a few. Explore the lush Australian wilderness on horseback or by bike. The next time you’re in Australia, book your CosyTent, for sure. The geometric windows if EcoCamp‘s glamping domes showcase unparalleled views of Patagonia. Explore one of “the world’s most classic trekking routes” or spot pumas and other wildlife on a once-in-a-lifetime safari. Maybe it’s time to see what Montana looks like in person, rather than on Instagram. Book your stay a Paws Up Retreat here. A little rustic-chic inspiration for anyone hoping to achieve glamping greatness on their own. If your kind of trip includes staying in a truly unique space, skip a boring hotel in favor of a room that really has a view. Book a trip with Chobe Under Canvas for an experience like this one. 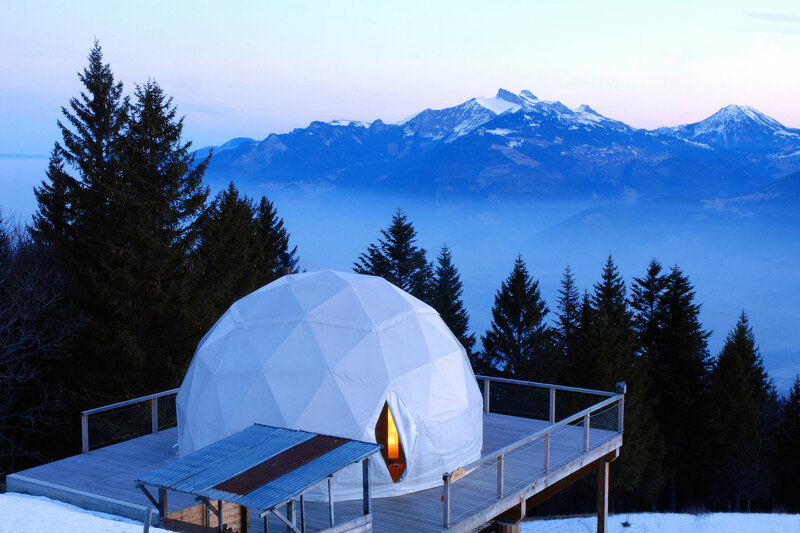 At Whitepod in Monthey, Switzerland, ski on private slopes in the winter or paraglide in the summer at this beautiful Swiss escape, surrounded by mountains. It’s okay to bring things indoors, when necessary. We can’t think of a better way to go glamping on your own than with a tent you won’t see on any other campsite. Get your own hanging Roomoon tent here. Glamping resorts are serious about this stuff, right down to the dining tent. This magic is a real place, and if you’d like to visit, start here. We loved this one so much, we needed two photos. Book a stay at Clayoquot Wilderness Resort here. It’s certainly high on our list!